After our success with the Estings competition E4 asked to create an ident to air when films are shown on the channel. It needed to embody the channel’s unique brand of slightly dysfunctional and irreverent humour and most importantly it had to feel like an epic film production studio title sequence…in just 3 seconds! We pitched several ideas and E4 honed in on one idea in particular asking if we’d consider using a real kitten in place of a 3D animated character we had proposed. We jumped at the chance of incorporating live action into the animated ident and arranged the shoot. Eight week old siblings Ruby and Bryn were born performers, and after much finger wiggling we got the footage we needed. Filmed against a green-screen, we later keyed out the green to set against our night sky. The rest of the design featured a surreal and opulent setting, complete with 2D animated twin cyclops-kitten-cherubs. A sting of Hollywood blockbuster proportions, featuring a hybrid of 2D, 3D and live action. 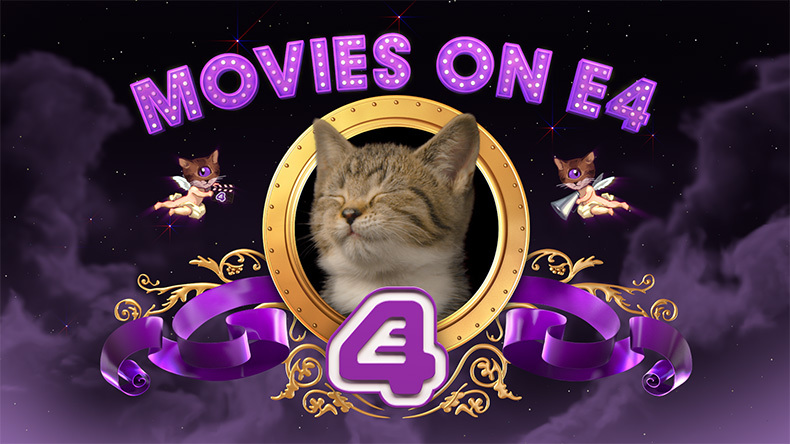 With multiple variations delivered using different kitten footage and silly sound effects there’s a whole host of giggles to be had. As our first foray into the world of live action we are excited to have this one under our belt and relish the next opportunity to work with animals or kids.